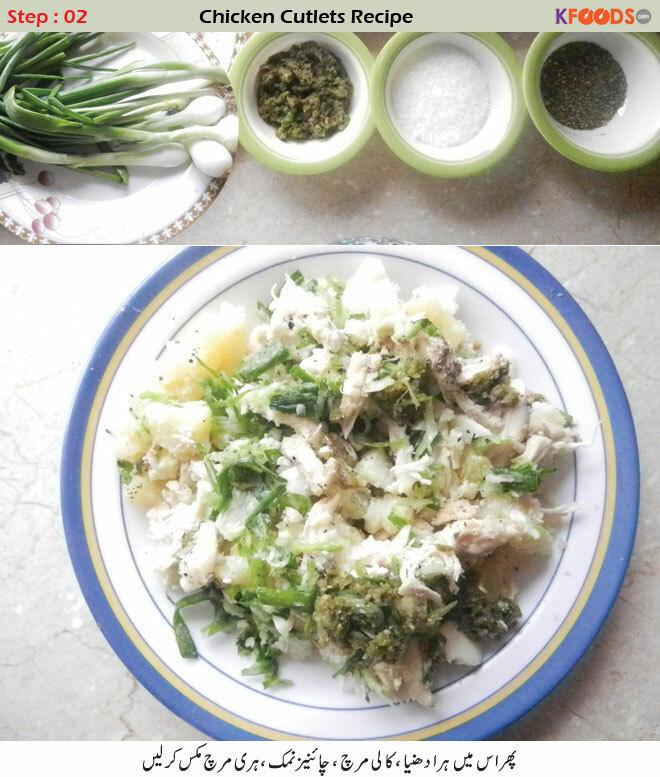 Boil eggs, chicken and potatoes. 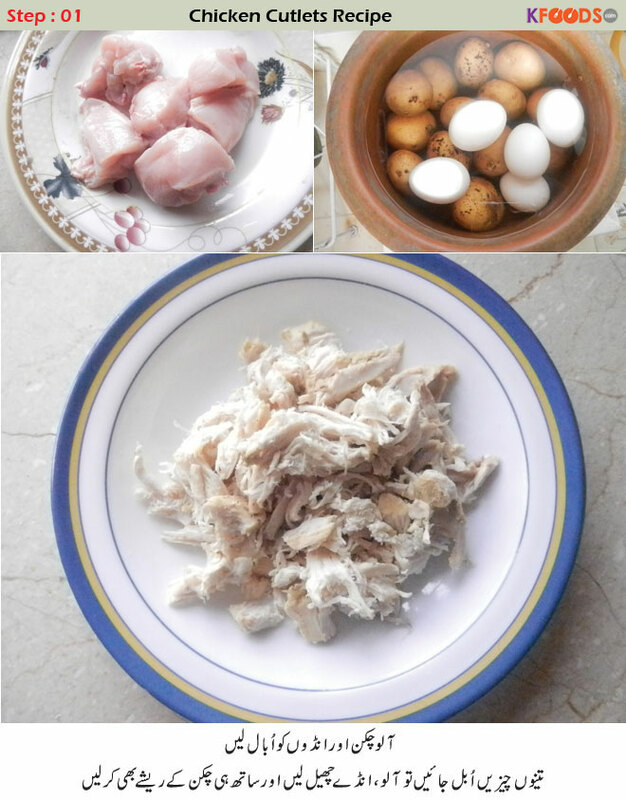 Peel off eggs and potatoes when boiled and shred chicken into fibres. Add green coriander, black pepper, Chinese salt, green coriander and green chili. Make oval shaped kababs of the mixture. Dip kababs in eggs, roll in corn flour, dip in eggs again and fry. Serve with salad, green chutney and ketchup. A chicken cutlet is an ideal snack to enjoy with evening tea. I like enjoying cutlets very often with my family at teatime. 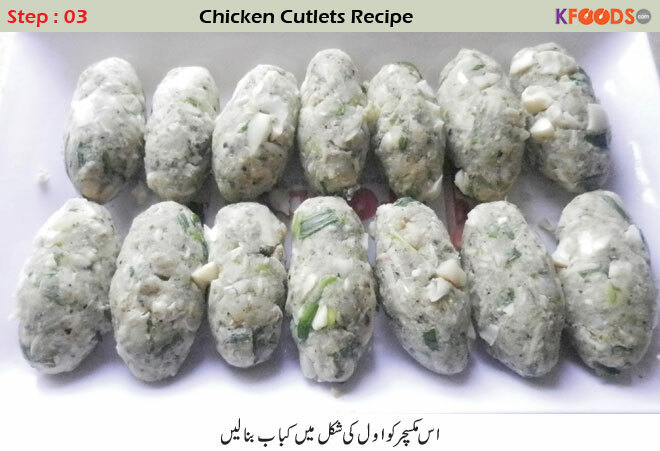 My today's post guides throughout the process how to make chicken cutlets in Urdu with step by step visual guide. I am presenting the recipe via KFoods.com so you could make it without any trouble. Cutlets are served with tomato ketchup, chili garlic sauce usually as a breakfast item. It can also be served as a side dish with meals. Normally, people like to have it at morning and in the evening as a light chicken snack. Since, while writing these lines, it is the month of Ramadan ul Mubarak, I often prepare this dish at iftar. 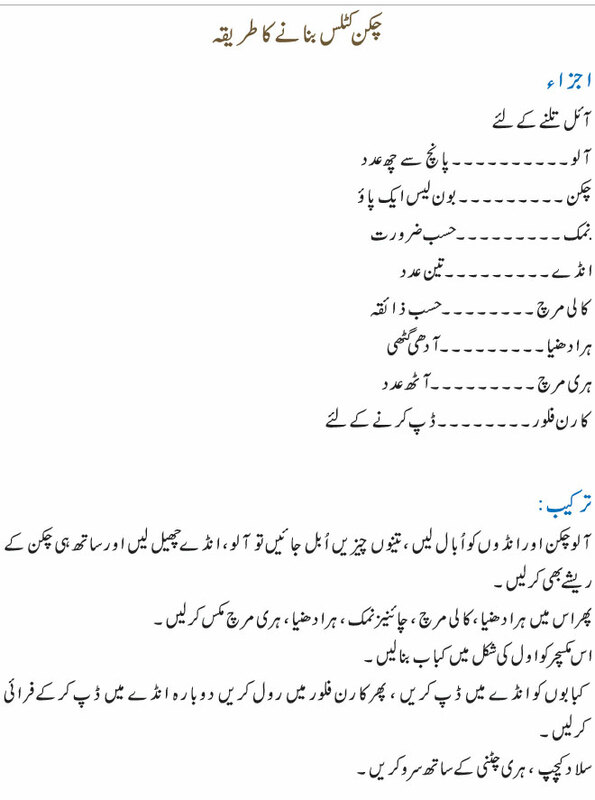 Purpose of telling you all these things is that today we are going to learn how to make chicken cutlets recipe in Urdu (English may be posted later if required) with pictures of each step involved. This step by step recipe guide would help you greatly while you intend to make this lovable snack. Recipe is very simple; you don't need a long list of ingredients. Just gather chicken, potatoes, eggs, salt, and a couple of more spices which are mentioned below in the recipe. Further steps of the recipe are also simple. You would make it very easily and don't be late as these kinds of dishes are perfect for iftar time. Did you enjoy chicken cutlets recipe by KFoods.com? Share about it taste in the comments box below. Let's learn the delicious recipe of chicken cutlets with step by step pictures presented by KFoods.com. Pakistani people eat it very passionately as snack. Served as an iftar snack or evening tea item, it is loved by everyone. 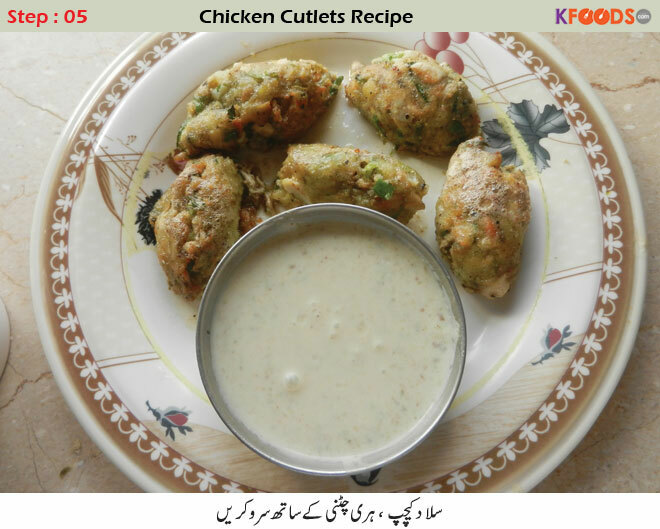 Following is chicken cutlets recipe in Urdu. Try vegetable cutlets recipe with it as well. I love home cooking, expertise in Desi and BBQ items, wish to explore my homemade cooking to all the users through Pakistan's best cooking site KFoods.com. 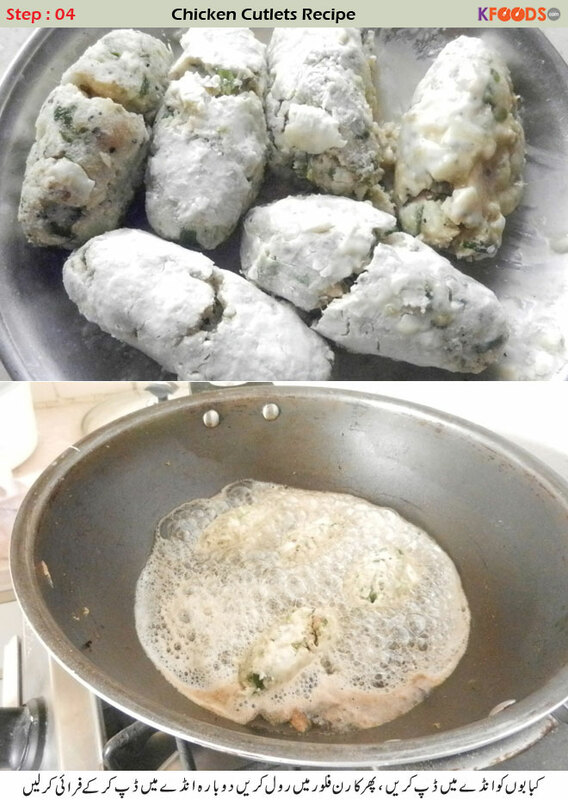 Chicken Cutlets Recipe is very yummy and is a delicious tasty dish this is the perfect is a fantastic recipe way to make it at home I made it for the first time in my life and my family Its awosome with the lots taste also it my first try is the best experience love it to make it. V well done. Quite simple n tasty recipes in a very simple way. I hope everyone can learn cooking by this way. We all family like all these kinds of snacks such as cutlets, croquettes, spring rolls and aloo vada. I got its recipe here which is actually a recipe that we can call 'proper'. I have been exploring the internet for food recipes for long time but this pattern is the best way to explain cooking. Yeah, it is a fantastic recipe, presented in a fantastic manner. I would love to eat it in today evening. And also Ramadan month is coming , I will also follow this recipe in iftar time and make delicious foods. Read Blog about Chicken Cutlets Recipe and health & fitness, step by step recipes, Beauty & skin care and other related topics with sample homemade solution. Here is variety of health benefits, home-based natural remedies. Find (Chicken Cutlets Recipe) and how to utilize other natural ingredients to cure diseases, easy recipes, and other information related to food from KFoods.